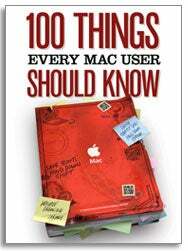 Macworld's collection of 100 things every Mac user should know is now available in Apple's iBookstore as a $0.99 e-book. We all like to think we’re pretty savvy when it comes to using our Macs. In the case of the typical Macworld reader, that’s usually true. (You’re all unusually handsome and have wonderful singing voices too.) But there’s a funny thing we’ve noticed when we talk to Mac users, even the supposedly savvy ones: There’s often some essential information—basic things that would make their Mac use easier or more efficient—that they’ve either forgotten or never learned. You probably know many of these 100 things. But we’d bet you don’t know them all. If you can really, honestly say you knew them all, you’re savvier than any of us. While you're in the iBookstore, check out some of Macworld's other titles, including the Mac Troubleshooting Superguide ($9.99), the iPhone and iPod Touch Superguide ($9.99), and the free iPad 2 Starter Guide.